I went out and purchased some cleaning material. I am very interested in your opinions guys, newbie here. I can't find a single video online comparing the two, so I purchased both. 5 users thanked cstone for this useful post. I clean guns when they need it, not like they are surgical implements. At least once each year, I will detail strip the gun into it's metal parts and plastic parts. Metal parts will sit in a tub of mineral spirits for an hour and plastic parts will get washed with dish soap. Everything is brushed clean with a toothbrush or rag. The bore will get a few swipes with a nylon brush, followed with some dry patches on a jag. Once the bore is clean and dry, I will run one patch lightly coated in oil down the barrel. The ouside of the barrel will get some oil on the barrel and locking lug, not the chamber area. All of the springs will get a finger of oil wiped on them. The slide rails will get a dab of grease. I will cycle the handgun several times to work the grease into the slide rails. The exterior of the pistol will then be wiped down to get any excess grease or oil off. 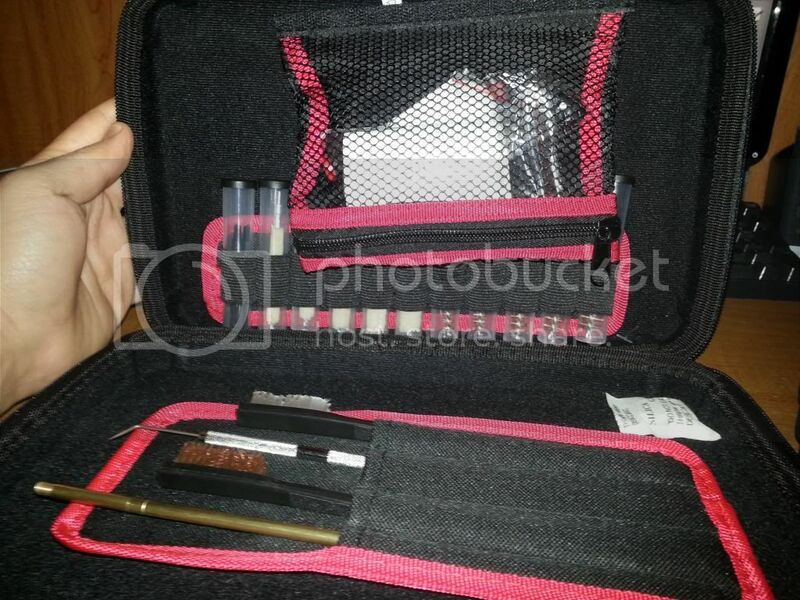 The gun is then stored in it's holster or case. 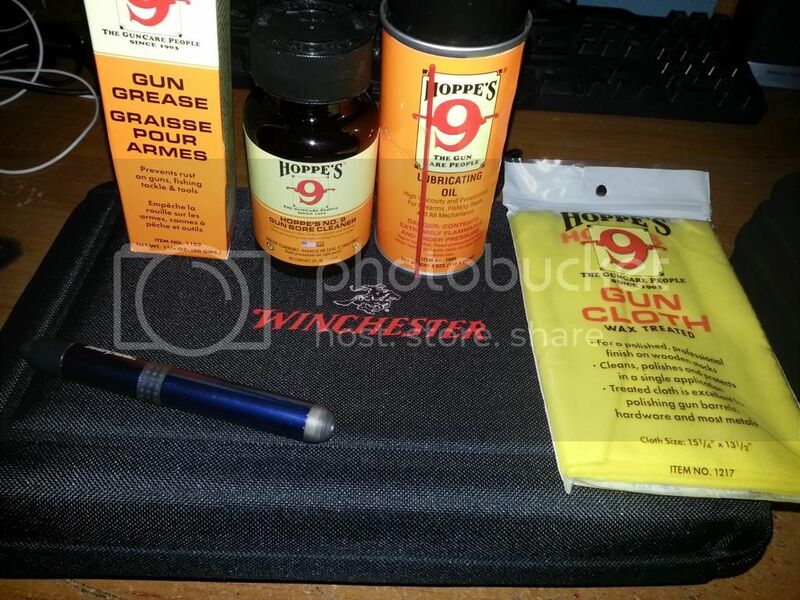 For quick cleaning, I will field strip and spray the metal with brake cleaner or toothbrush with Hoppes. Clean the bore of the barrel as stated above and lube as stated above and store as stated above. AK's are actually easier to clean during warm weather. I have polymer furniture on my AK's and I live in a sunny, dry climate. I field strip them and use a garden hose, followed with hot water and dish washing liquid. Sun dry for about an hour, wipe down and lubricate with motor oil. If I don't have time to clean, I will spray the weapon down with some canned, compressed air, wipe with a rag and lubricate. These are tools. The high stress areas are made of heavy duty metal designed to withstand high temperature and extreme pressure. With proper lubrication, they will provide good service for tens of thousands of rounds. Once in a while a spring will break or a small part will need to be replaced. Over cleaning has ruined more barrels than shooting. Always clean from the breach. Use a good, one piece coated or carbon cleaning rod, and don't get obsessive about cleaning. For most guns, lubrication is more important than cleanliness. Some guns work best wet, but most modern semi-auto handguns just need enough lubrication so that you can see that it is present, not enough that it runs or drips. Over time, you will see where the gun needs lubrication. Metal on metal contact becomes obvious when parts begin to shine. Barrel smilies are an obvious example of this. Oil on the barrel helps but will not prevent this. It is natural and will not harm or cause the weapon to malfunction. Just enjoy shooting the gun. If you enjoy cleaning, great, but most of us clean to shoot, not shoot to clean. I just use Break-Free Powder Blast for the places lub is bad (striker channel mostly) and then Break-Free CLP to do everything else. After a total cleaning and wipe down, some Tetra gun grease on the rails. Done. Walmart sells the Break-Free products. Tetra is available online and many/most gun shops. I have 2 questions about cleaning. cstone: oil the outside of the barrel but not the chamber area? From what I see on the chamber area a wear pattern develops on the top of this area. A wear pattern indicates the need for lubrication. What about cleaning the firing pin area inside the slide? Doesn't this need cleaning and some lubricant to stop corrosion? Usually lubricant is bad in the firing pin area (my comment about the striker channel, which is incorrect w/ regard to the Sig, more of a general statement on my part). But lub in that area can eventually gunk things up and cause a problem (light strikes, etc). That's where I use a non-lubricant cleaner like the Break-Free powder blast I mentioned. I use eezox and TW25B. I don't normally put oil on exposed areas of a handgun. The block shaped, chamber area of the barrel is exposed on two sides when the barrel is in battery. Oil attracts dust and dirt and for the small amount of wear on the top of the chamber area, I prefer it dry. The outside of the barrel is inside the slide and has some contact (mostly the top of the barrel) with the slide which creates the barrel smiles. If I was short on oil, that would probably be the area I would let go dry. The barrel lug definitely needs a quick swipe of oil. Primers and oil do not mix. For that reason, I have always kept oil/grease away from firing pins. The channel where the firing pin resides is not very exposed and if it is kept clean it shouldn't give you any problems either with gunk or corrosion. If you get some light surface rust anywhere on an everyday carry gun, a little Hoppes on some denim will take it off. When I lived in Alabama and on the east coast, I used more lubrication than I do now living in Colorado. If you find something that works better for you and your guns, by all means, go with what works. Location: Most SW point of Arizona! clean when needed, not after every outing. Well I guess I'm cleaning my gun to often? I've cleaned it after every shooting (50 rounds - 200+). Is this to much? Does that cause an issue or just overkill? How many rounds would you (anyone) recommend before cleaning? I see no problem if you like to keep your guns SUPER CLEAN, but too much oil or grease could attract dirt. I think MOST folks are going to say exactly what davidcolebrooks said, clean them with every range trip. If you don't shoot that often, clean them every few months for a number of reasons, familiarity, inspection, working order, ready to go. I saw a survey once and this was well over 90% of the people. There are always exceptions. You are busy, planning multiple range trips over the course of a week or two, then maybe don't worry about it. But for the most part, cleaning with every trip to the range is the minimum most folks do. I keep my guns cleaned, lubricated, but not really 'wet'...just coated lightly where it matters and then wipe the exterior down.